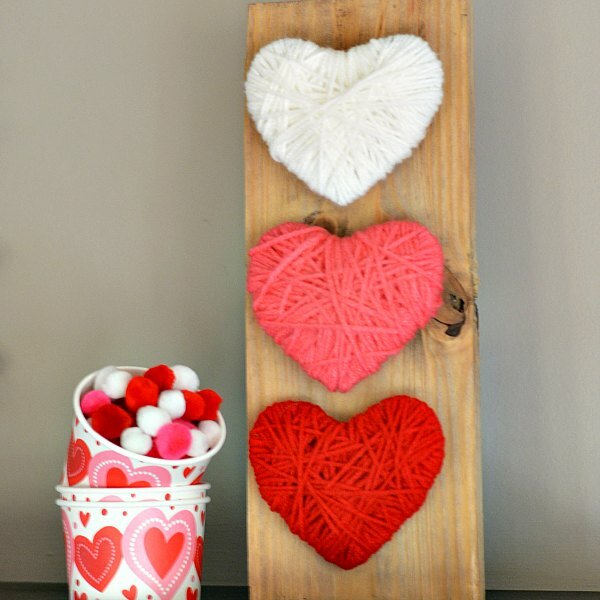 An easy Valentine's Day heart wood pallet craft is the perfect antidote to putting away the Christmas decorations. This is a great kids craft, too. One of the saddest days of the year is the day we take down the Christmas decorations. I wait until the last possible second to put them away. I miss the lights the most but also all the other festive decorations. Putting up a few Valentine's Day decorations helps to ease the transition back in to normalcy. 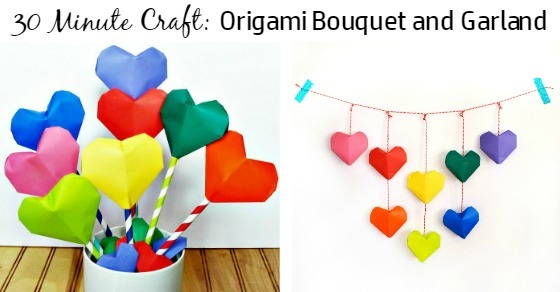 I love our Origami Heart Garland with all it's colors! 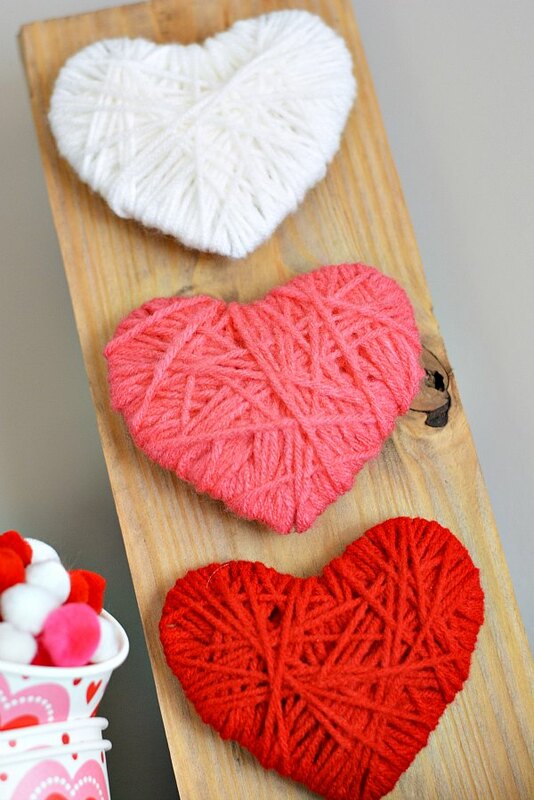 These ombre yarn hearts on a pallet are another fun way to infuse a little love in to your decor. They are easy enough to make so the kids can help, too. 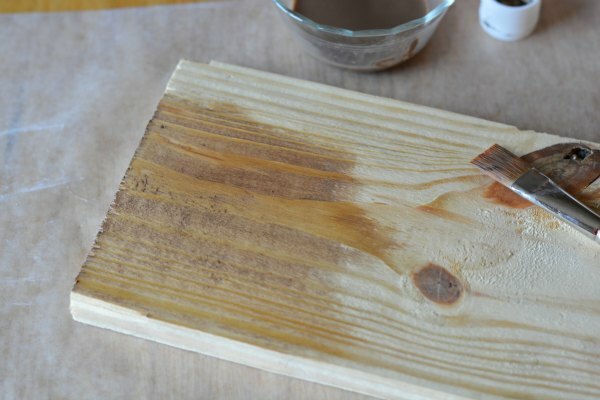 Prepare your pallet board by watering down brown paint and covering pallet board. Set aside to dry. You could also leave the pallet board natural. Cut out a heart shape out of plain paper with scissors. You might need to try several times to get just the right heart. You want a “deep” V in the center of your heart. You'll fill it with yarn, so the deeper the better, otherwise, you'll start to lose your heart shape. You can use our heart template as a guide. 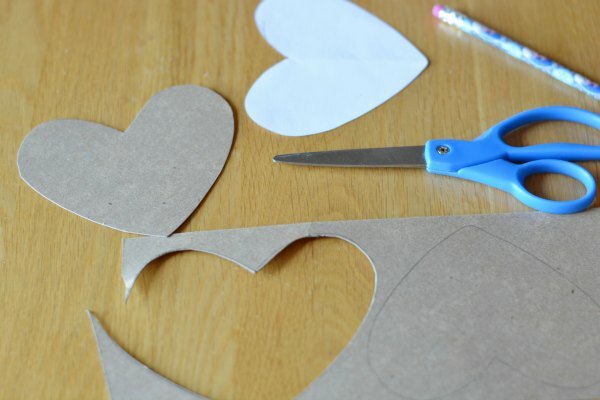 Place your paper heart pattern onto cardboard. Trace with a pencil and cut the heart shape out with scissors. Repeat so you have three hearts. 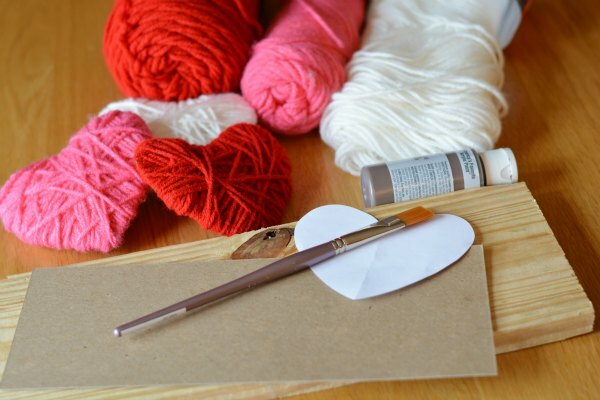 Use the yarn to wrap your cardboard heart. There's no right or wrong way. Wrap in the same direction about three our four times until the cardboard is covered and then randomize the yarn wrappings. Repeat until you have one white, one pink and one red heart, or any colors of your choice. 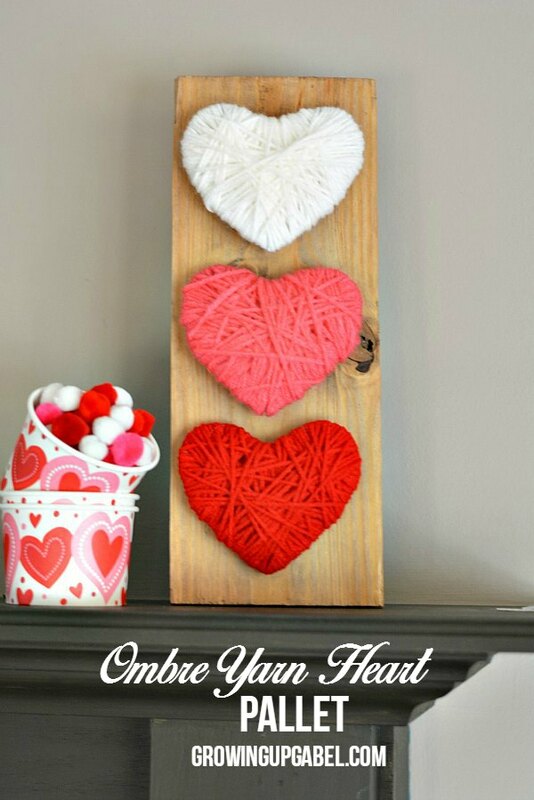 Place the three hearts onto the pallet board in the position you'd like (horizontal, vertical, straight or angled) and affix with hot glue. And that's it! The heart pallet board is ready to display with love! This would great on a mantle with an origami heart garland or bouquet! Hi Camille, those hearts are super cool and I really love how they are easy to make and how they also blend well with the pallet. I think I and my younger sister who is just crazy about crafts should do something like this over the weekend. Thanks a lot for the share. Hi Camille, we loved these hearts at Throwback Thursday and featured them this week! I wish I were closer to my grandbabies because they’d be a perfect craft to share with them! They’re cute, fun and classy and you make the look very doable! This is absolutely adorable!! I love yarn art and I just so happen to have bought some for projects I didn’t get to over Christmas! This will be featured at tonights Throwback Thursday link party! Hope to see you there! I love how easy this is. I can quickly do this with my students. Love it! Such a cute Valentine project!! Thanks so much for sharing Camille! THis is such a cute project!! Pinning to my Crafts and now if I can get my son to cut me a piece of pallet rack. Love this! What a fun Valentine’s day project. I picked you as one of the features for this upcoming Wonderful Wedneday Linky Party. Hope you come back to visit us again this week, starting on Tuesday night. Such a creative use of extra yarn! It turned out so cute! I’m stopping by from the Handmade Hangout link party — I shared your post on Pinterest and StumbleUpon. These are really cute, I love the idea to display them as art. Super cute Valentine’s wall art! I pinned it to my wedding board to share and because my daughter, who is an avid knitter and crocheter, is getting married this summer and something like this would be perfect for her guest table. Thanks for the inspiration! Cute idea! My sister is getting married next year and I’ll suggest that to her! 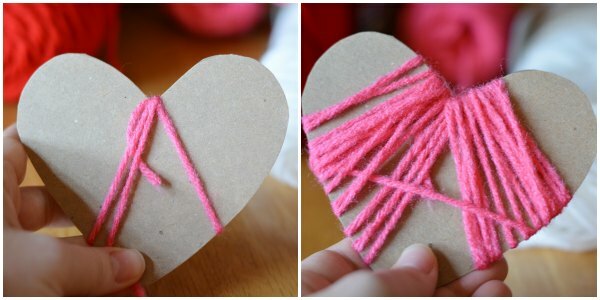 Cute and easy Valentine’s Day craft! I miss my Christmas decorations too 🙂 Thank you for sharing with us at Snickerdoodle Sunday! Pinned and tweeted to share. Have a great week!